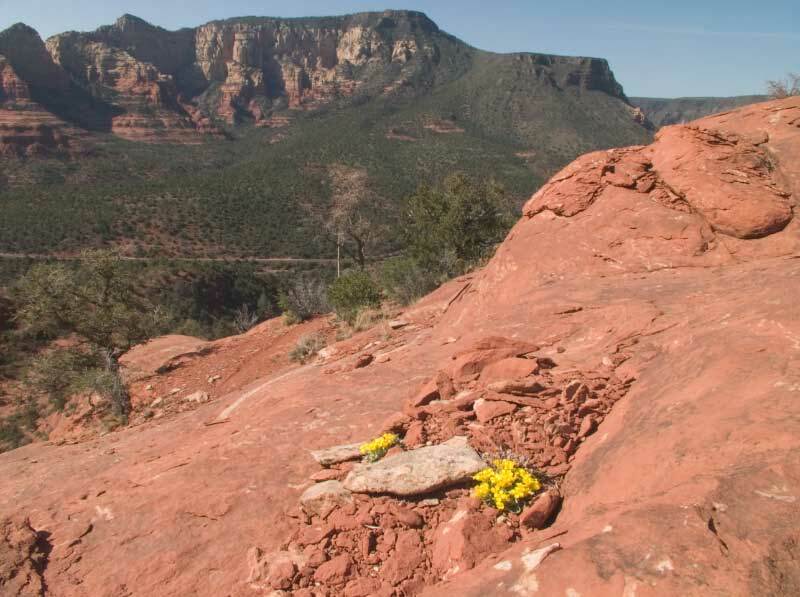 The Damifino Trail is one of Sedona's best kept secrets. It seems to be a new, official, Forest Service built trail. But I haven't found anybody at the local Ranger Station who knows anything about it. 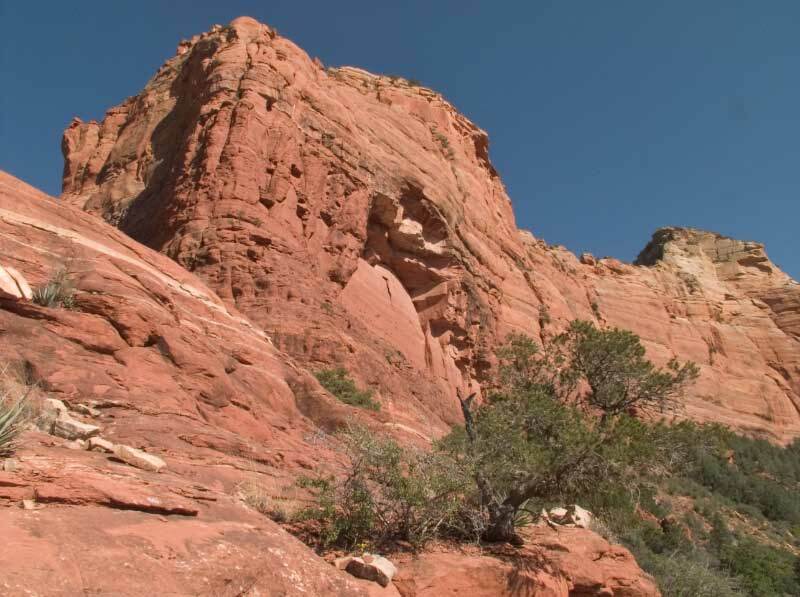 The name is confusing, because about a mile from it as the crow flies, across Bear Wallow Wash, there is a small canyon called "Damfino Canyon." (Notice the missing "i" before the "f.") The trail starts far from any road -- it's only accessible at the south end by an unofficial, social trail. The north end is at a hard-to-find, little-known trail which you can only reach by crossing Oak Creek: as a minimum you're going to get your feet wet (bring sandals), but at times in spring and in Monsoon season, the water is too high for a safe crossing. But the views from it are breath-taking. 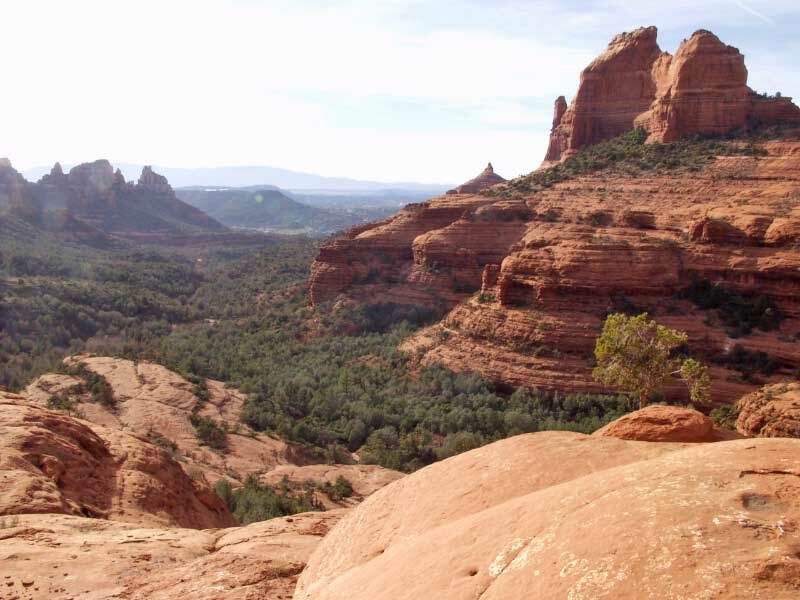 A friend thinks it's "Sedona hiking at it's best" and "It's a Disneyland for grown-ups." The hiking is at times mildly challenging. It seems to be well-known to mountain bikers and unknown to everybody else. 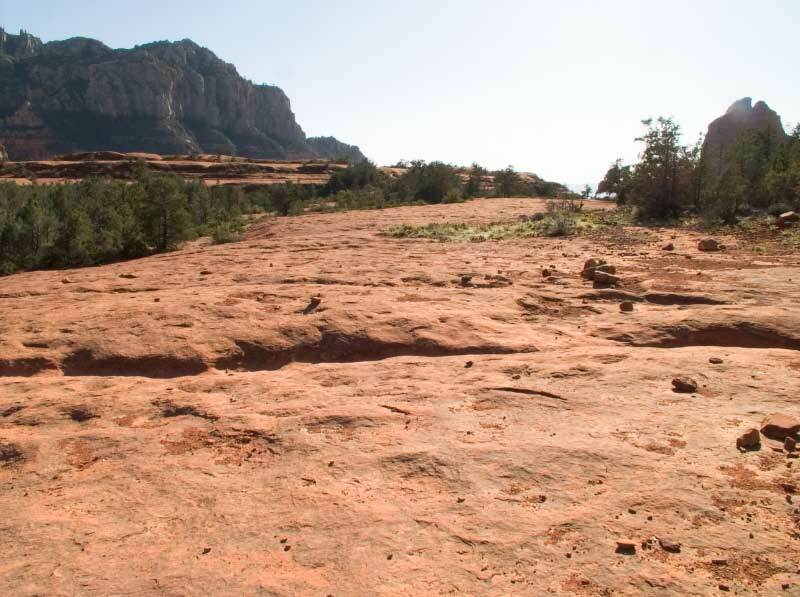 The trail leads from Mitten Ridge Saddle down to where Casner Canyon Trail crosses Oak Creek, about 1.6 miles long and with an elevation loss of almost 720 feet. 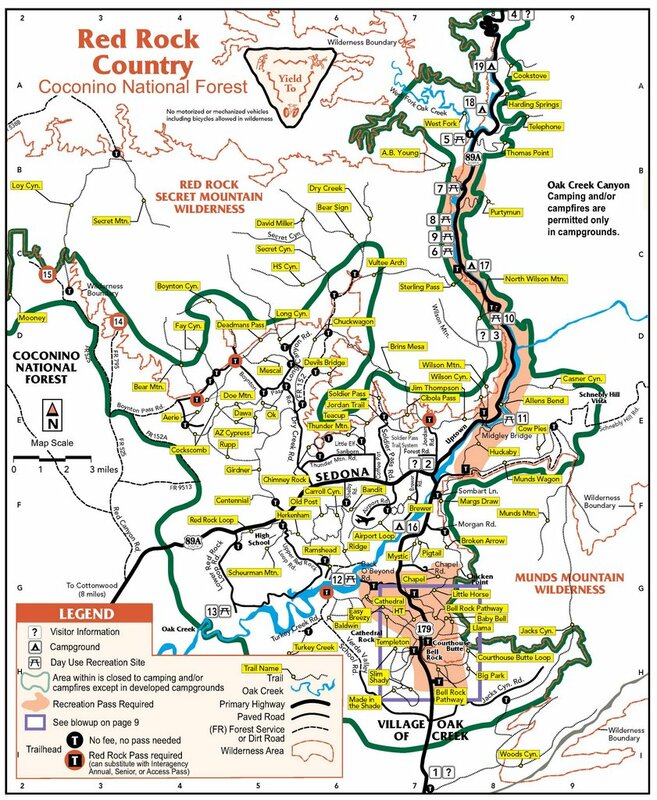 You can hike it or bike it as part of a 10 mile loop trail, but you can't only hike the Damifino trail: both trailheads are only accessible from other trails. 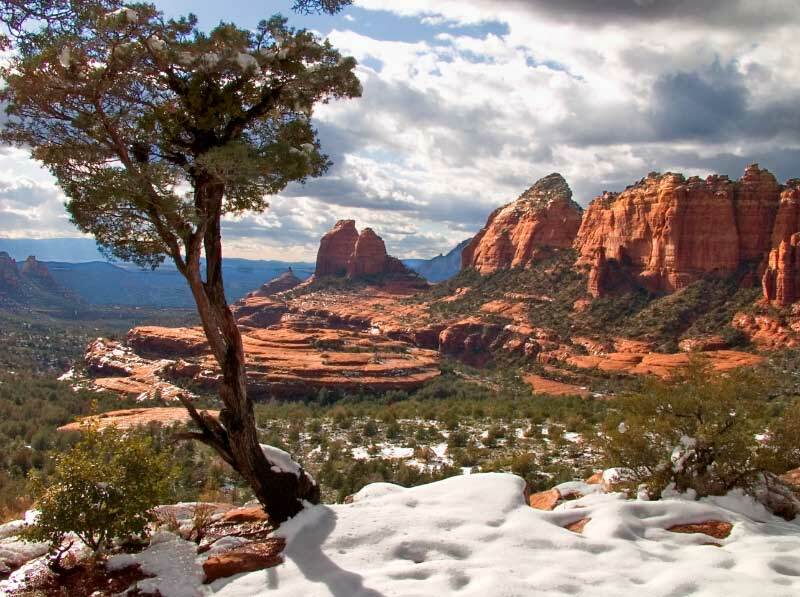 A reasonably short but beautiful option is to hike to Mitten Ridge Saddle, pick up Damifino and hike as far as you like and then return the same way for a four to six mile hike. There are several natural return points. I'll first describe the hike starting at what I call the Three Mile Schnebly Hill Road trailhead, then quickly summarize the full 10 mile loop. 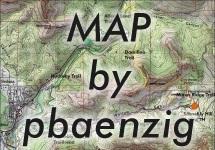 You can find detailed descriptions of most individual sections of the loop here on HAZ, listed under the names of the trails that make up the loop. 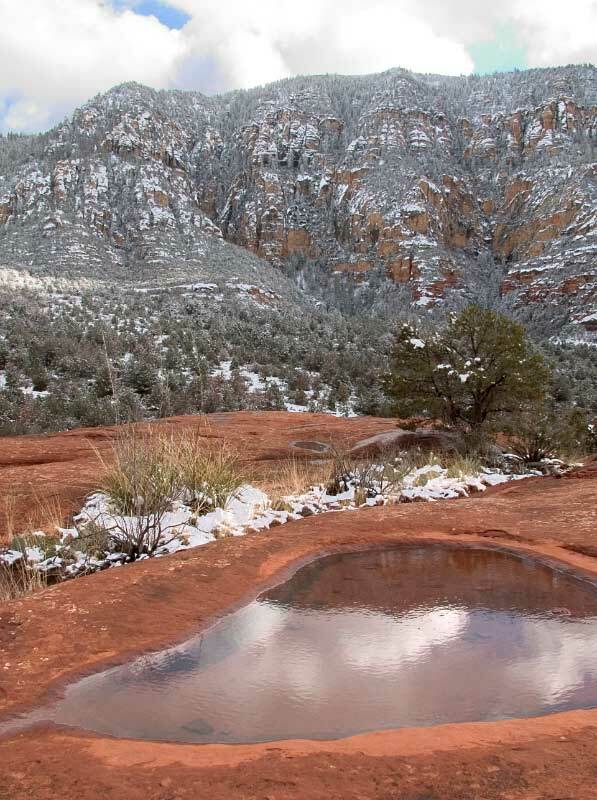 The hike to Mitten Ridge Saddle starts at the "Cow Pies Tr" sign, on the north side of Schnebly Hill road at the Three Mile parking area. The trail first leads down a bit into a branch of Bear Wallow Wash and crosses the wash (normally dry). Shortly after, you'll start walking for a while on flat, red slick-rock (which is anything but slick), covered with scattered black basalt (lava) chunks. You'll see the Cowpies off to your left. If you have the time a detour out onto those rock formations is worth the effort. The turn-off to the Cowpies can be hard to spot, it's about a third of a mile from the start of the hike. After the first slick-rock stretch, the trail begins to climb a bit, then descends to a second shallow dry creek crossing. Shortly after, you come to the second flat, red slick-rock area. There is no obvious trail on this flat rock. At times there is a hiker made cairn, signalling the turn-off to the left, but I find it knocked over quite often. Veer left before you come to the end of the slick-rock to get to the Cowpies, go straight if you want to bypass them. 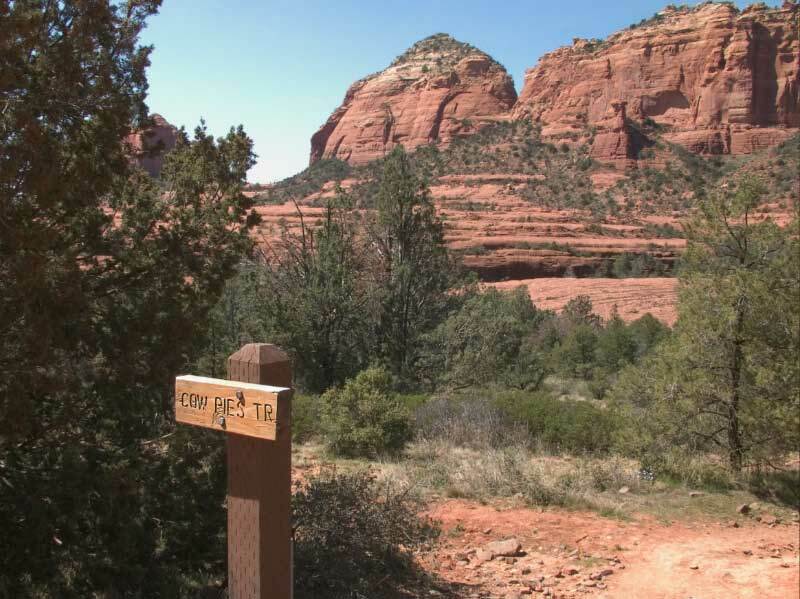 To get to the Cowpies, you walk southwest on the flat rock, then you'll see a real trail on a short stretch of "dirt." 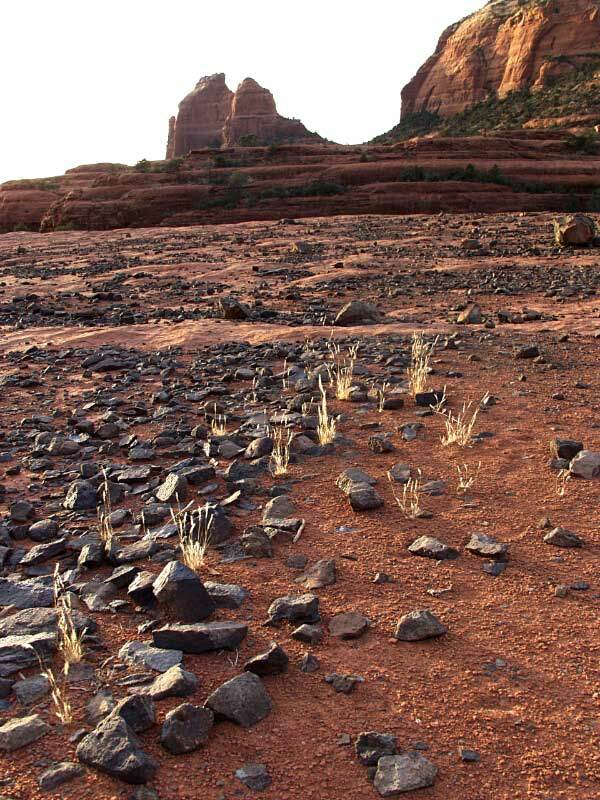 After that, just meander all over the great formations and return the same way. With some exploring and admiring of views, the whole side trip shouldn't take more than half an hour, less by bike. 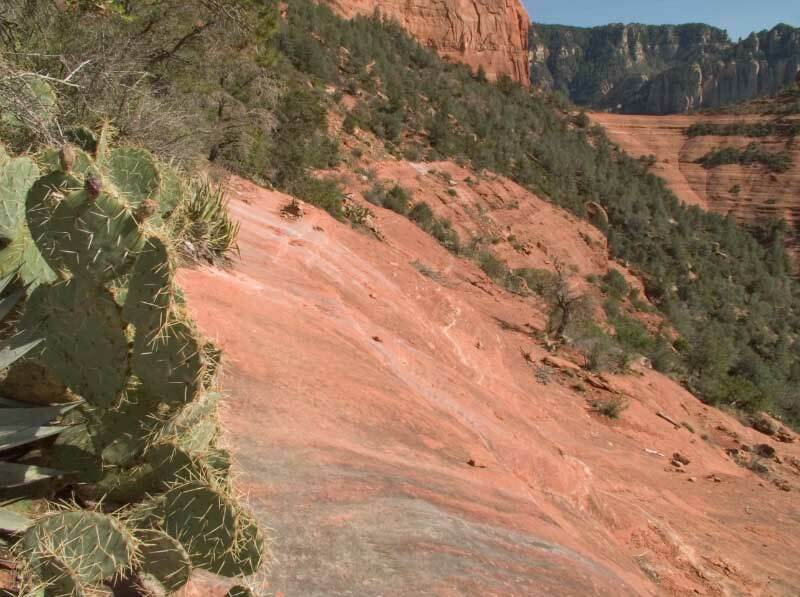 After the Cowpies turn-off, the trail to Mitten Ridge Saddle becomes an unofficial trail. You continue on the flat slick-rock to its end, going north. Then the trail starts climbing a bit. It generally follows the edges of the slick-rock, steadily gaining height. 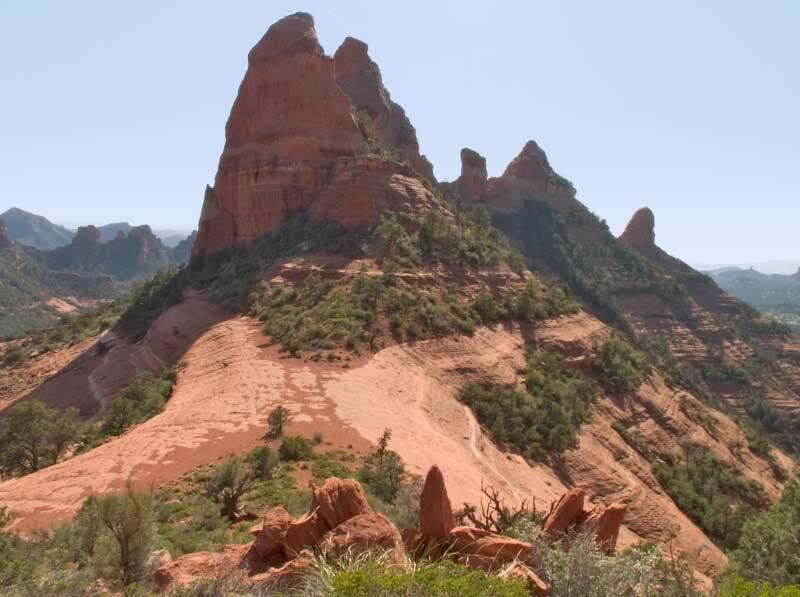 There isn't just one right trail going up, there are several, but they all guide you up and around the deep drop-off separating the Cowpies from Mitten Ridge. 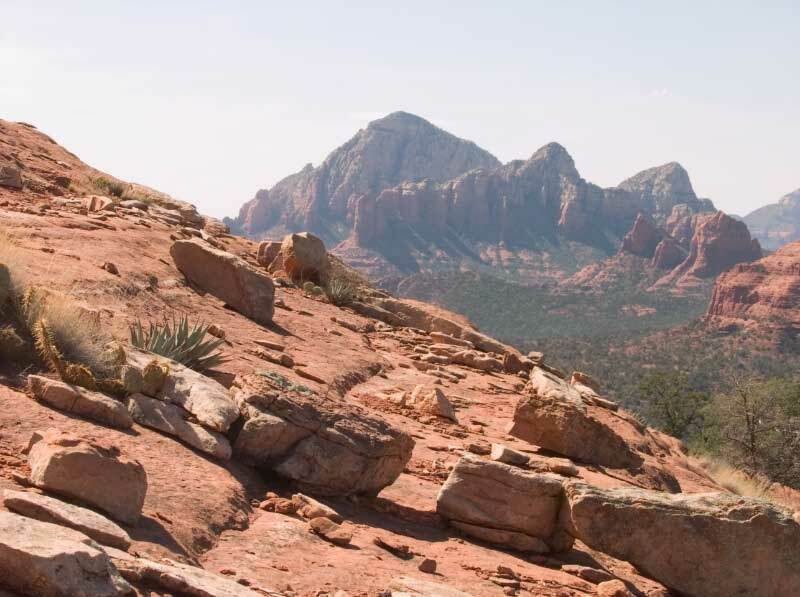 After you've gained the necessary height, the trail veers roughly west, skirting the drop-off on your left and following the bottom of the imposing cliffs of Mitten Ridge on your right. Again, because this is a social trail, there is no "right" trail. Follow whichever strikes your fancy, you can't really lose your way because you're walking on a at times narrow, at times wide ledge. 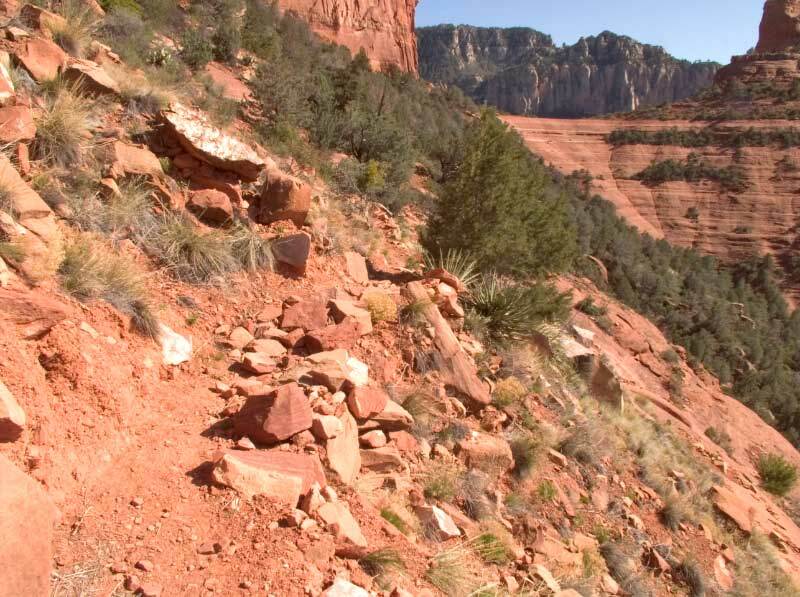 The trails meander around a bit when the ledge is wide, but otherwise head pretty much straight for Mitten Ridge Saddle which you can see ahead of you. 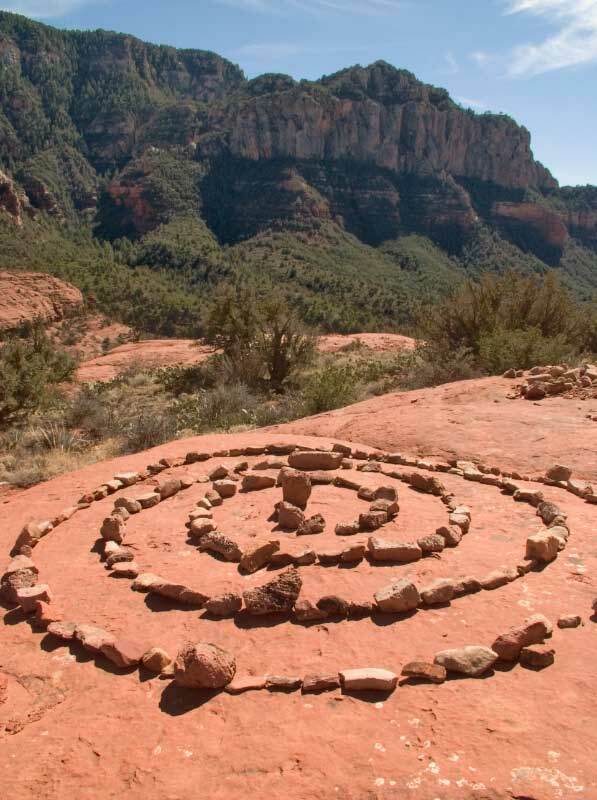 On some of the wider ledges you can generally spot some medicine wheels, circular arrangements of rocks by New Age followers. As you get closer to the saddle, the ledge gets wider and wider. Try to find a relatively high trail because you'll have to climb up onto the saddle. The most direct route is at the east end of the saddle, a trail skirting the edge of the slick-rock until you're almost at the top. You can also try the brute force approach and clamber up the ledges. And finally there is another, harder to spot trail at the west end of the saddle. 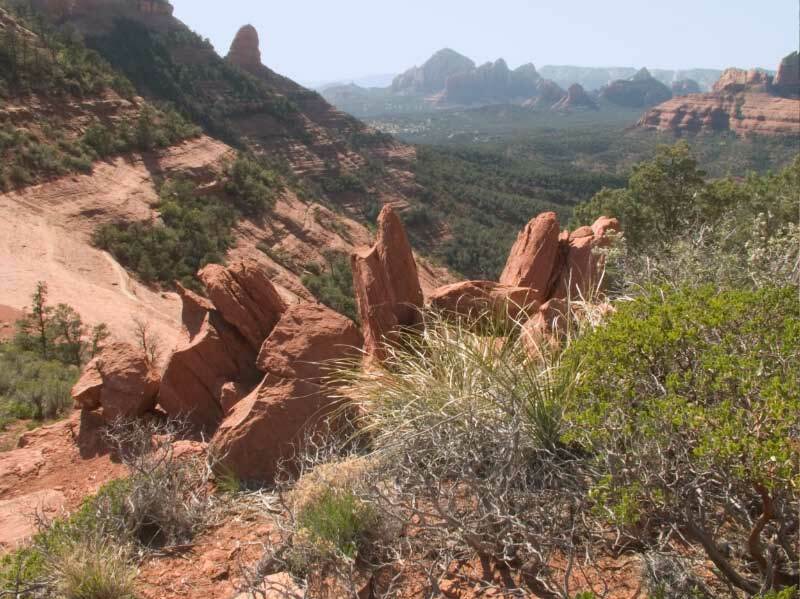 Mitten Ridge Saddle offers great views into Oak Creek Canyon. You'll see Midgely Bridge, Steamboat Rock and Wilson Mountain to the north, Bear Wallow Canyon and the cliffs of Munds Mountain to the south. And if you look carefully, a bit behind the big rock on the north east side of the saddle, you'll see a wooden sign and the beginning of the Damifino Trail. The Damifino trail is a well built trail at the bottom of high vertical cliffs. It crosses the steep mountain side slowly losing a bit of height. At one point two switchbacks lead to a lower level. 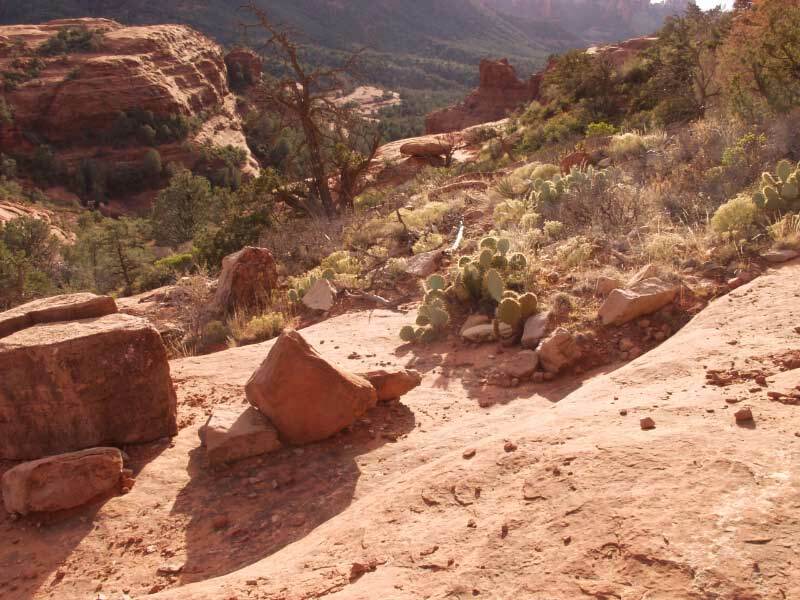 The trail heads basically north, towards the end of this north-pointing Mitten Ridge spur. 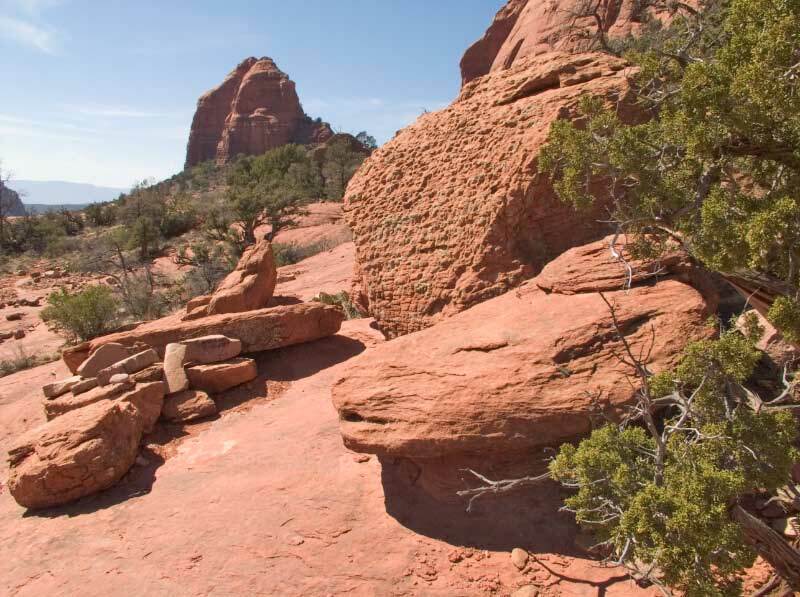 You'll be crossing one or two short, steepish slick-rock sections between the built-up parts of the trail. After about a third of a mile, the built trail ends at a large slick-rock area. The drop-offs are far from vertical, but they're steep and caution is advised, particularly on a bike. You'll hike on the flattish ledges, working your way around the end of the high part of the mountain. 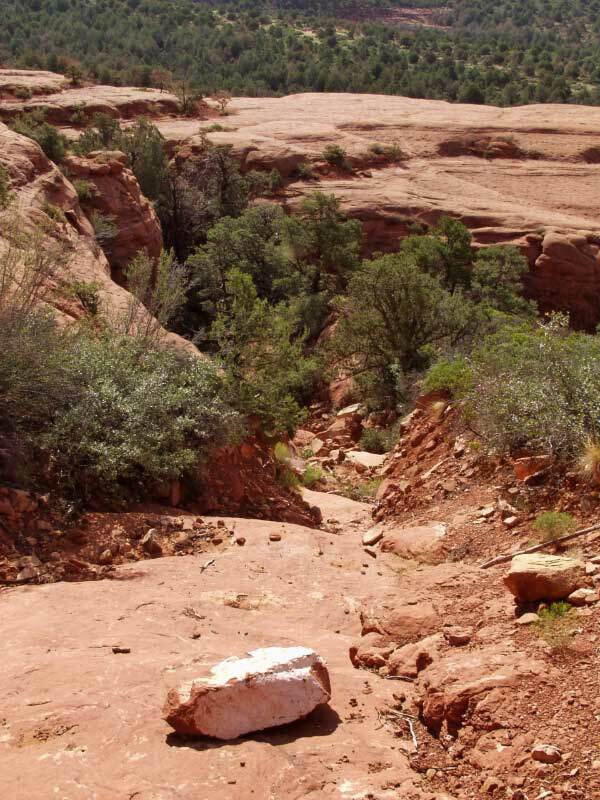 You'll have to work your way down the slick-rock ledges to pick up the trail at the bottom. The preferred way seems to be to walk on the two top ledges going east until you get to the end of the slick-rock. There you'll see bike and foot tracks leading down next to the slick-rock. Once you're almost at the bottom, you venture back out onto the slick-rock and head west until you're pretty much straight below where you'd come around the corner of the mountain. The way off the slick-rock is well marked and obvious. For the next 0.6 miles you'll hike on lower continuation of the ridge you've been following, heading straight north. The bikes leave easy to follow marks in the red rubble. There is a vertical drop-off on your left with some spectacular views down to Oak Creek and Grasshopper Point. The trail skirts the edge of the drop-off quite closely. At about 0.6 miles the bike marks seem to split -- one trail going off to the right, almost doubling back at a lower level, the other going straight ahead. The straight ahead track is the shorter, easier trail and leads you steeply down into Casner Canyon and connects to the Casner Canyon Trail. The trail branch going off to the right works its way down into the little shallow canyon to the east of the ridge. At one point this trail goes under a rock overhang which at times is a small waterfall. You'll have to work your way down this canyon, walking in the creek bed until you get to Casner Canyon. Casner Canyon Trail at this point is on the north side, so you have to bushwack your way to it. Once you're at Casner Canyon Trail, follow it west towards Oak Creek. It's less than a quarter mile. Cross Oak Creek any which way you can -- I usually bring sandals and at least one hiking stick. After crossing Oak Creek you have to work your way across a large boulder and snag field and a muddy little side branch of Oak Creek until you get to Allens Bend Trail. 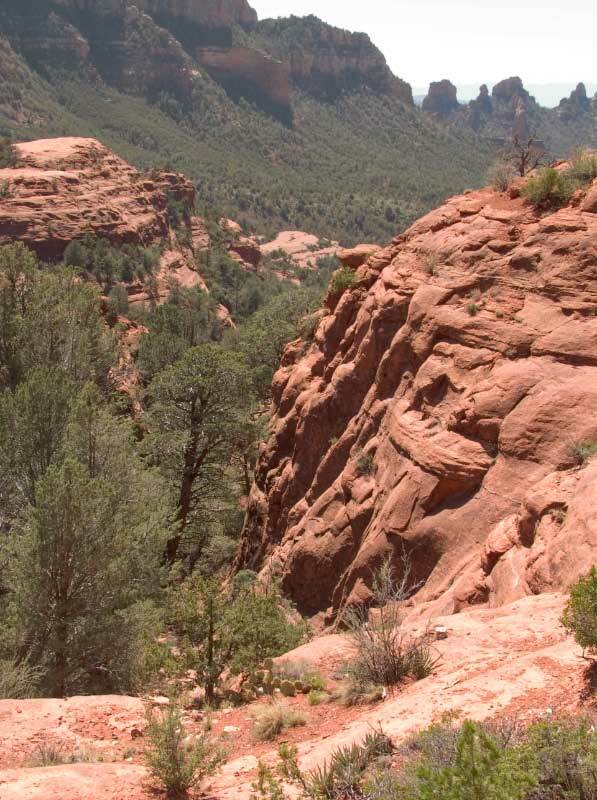 The trail is on the west side of Oak Creek Canyon, below SR 89A. Follow Allens Bend Trail south for about half a mile and you'll arrive at Grasshopper Point, a fee parking area. 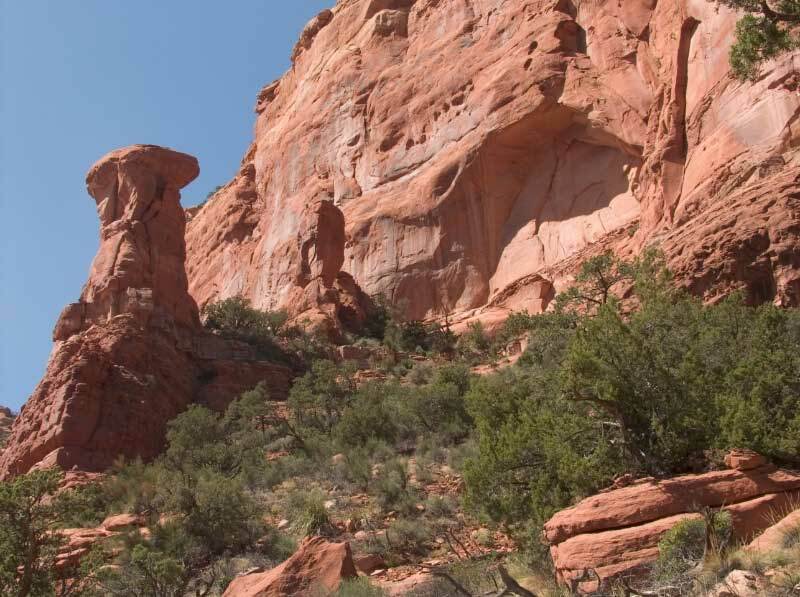 You can avoid paying the fee by hiking to Midgely Bridge, where the regular Red Rock pass is valid. But the Midgely Bridge parking area is often very crowded. 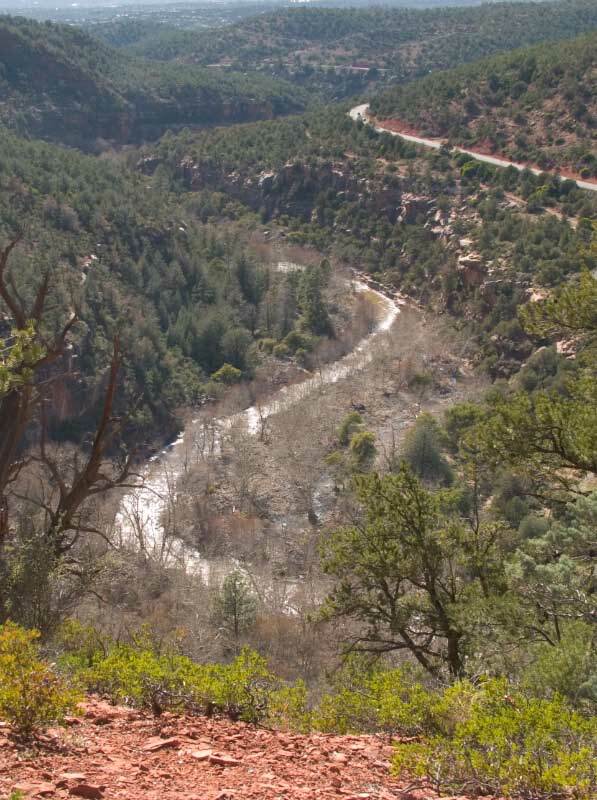 The unmarked, but obvious trail from Grasshopper Point to Midgely Bridge starts on the left side of the road going up to SR 89A, almost at the top. It's about half a mile to where it joins Huckaby Trail, then another eighth of a mile gets you to Midgely Bridge. 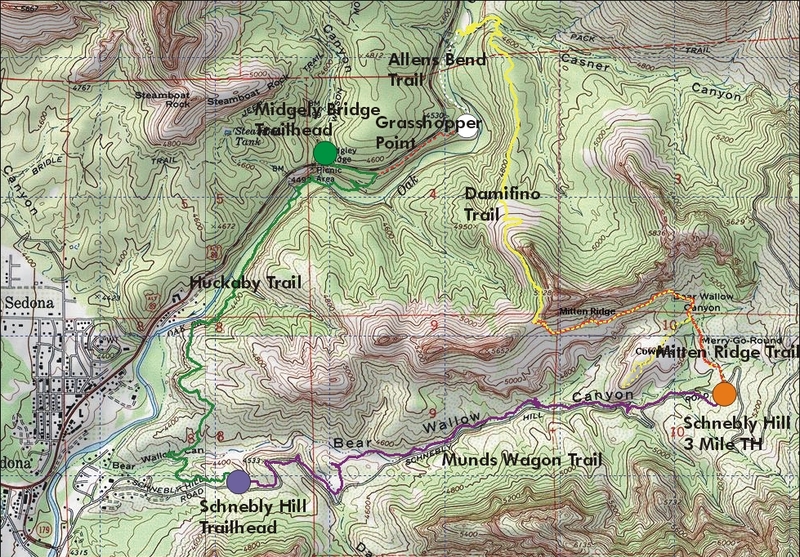 If you're planning to hike or bike the full ten mile loop, I suggest that you start either at Midgely bridge or at the Schnebly Hill Three Mile parking area, moving counter clockwise. If there have been rains, you might want to start at Midgely Bridge, following Huckaby Trail. This allows you to see right away if you can cross Oak Creek. If you can't cross at the Huckaby crossing, you certainly won't be able to cross at Casner Canyon crossing and it might be wiser to only hike the trail part way, starting from the Schnebly Hill Three Mile parking area. The Huckaby Trail leads you from Midgely Bridge to the main Schnebly Hill Road parking area. It's about three miles long and well worth a hike in its own right. In spring there are lots and lots of flowers. The main Schnebly Hill parking area is at the end of the paved part of Schnebly Hill road. From this trailhead you can follow Munds Wagon Trail for about three miles to get to the Three Mile Schnebly Hill parking area. Munds Wagon Trail follows Bear Wallow Wash for part of the way, with some nice red slick-rock features, and also for part of the way an old wagon trail. You'll be hiking for a way at the foot of the Cowpies. There are two trailheads leading to the Damifino on Schnebly Hill Road; the large parking area at the end of the pavement and my preferred, closer trailhead which I call the "Three Mile Schnebly Hill Road Trailhead". 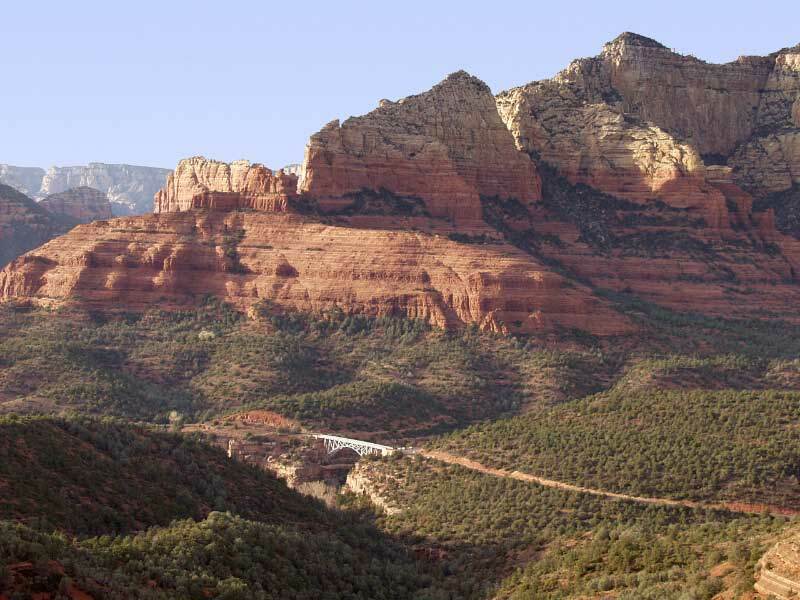 To get to either of the two trailheads you start from the Sedona "Y" (T-intersection SR 179 and SR 89A) and head south (towards Phoenix) on SR 179 for .35 miles to the Schnebly Hill Road turn-off on the left, just after the bridge crossing Oak Creek. Follow the paved road to the end of the pavement, about 1 mile. This is where you find a large parking lot on the left which is the trailhead for Huckaby Trail, Margs Draw Trail, and Munds Wagon Trail. You can hike east and up from this trailhead on Munds Wagon Trail to my preferred trailhead or you can keep on driving on the the moderately rough unpaved part of Schnebly Hill Road (passable for passenger cars if you drive slowly) to the three mile marker on the right of the road. You'll find a parking area on the right with a sign for Munds Wagon Trail going roughly south and, across the road going north, a sign labeled "Cowpies". This "Cowpies Trail" is the beginning of the approach to the Damifino Trail. 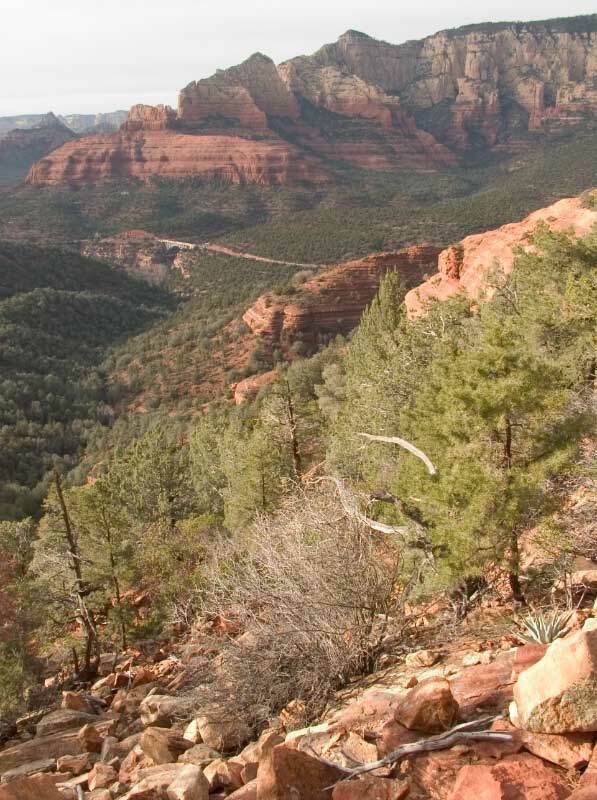 There are two trailheads on SR 89A that lead to the Damifino Trail, Midgely Bridge Trailhead and Grasshopper Point Trailhead. Midgely Bridge Trailhead is often overcrowded; Grasshopper Point is a fee parking area -- $5(as of this writing), Red Rock Pass not valid. 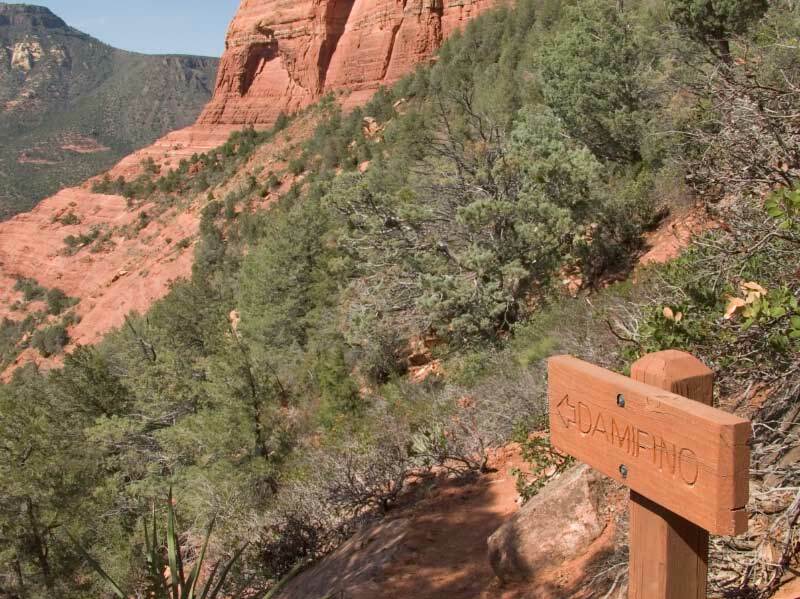 In addition, the Damifino trail is easier going from the Schnebly Hill area -- all downhill. 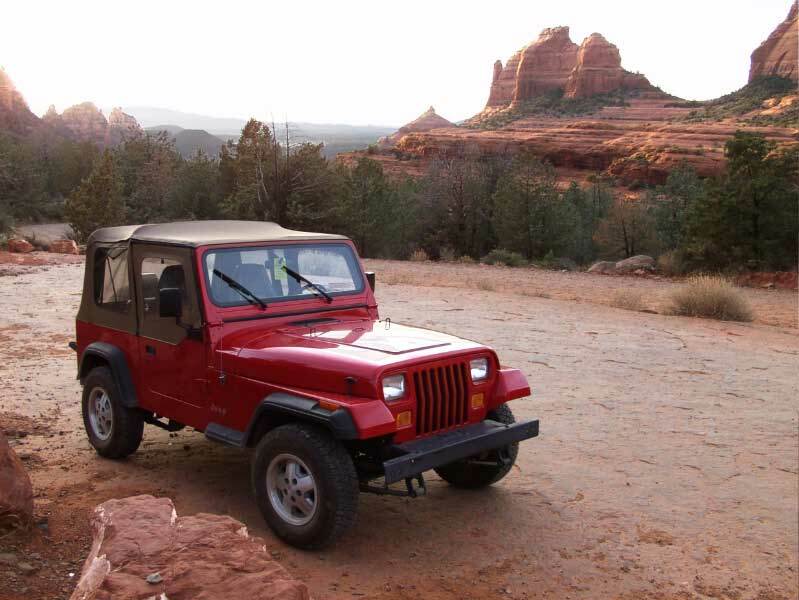 But if you park at one of these trailheads, because of possible high water in the creek, here are the directions: From the Sedona "Y" (T-intersection SR 179 and SR 89A) head north-east towards Flagstaff for about 1.9 miles. Just after crossing Midgely Bridge, you'll see the parking area on your left. 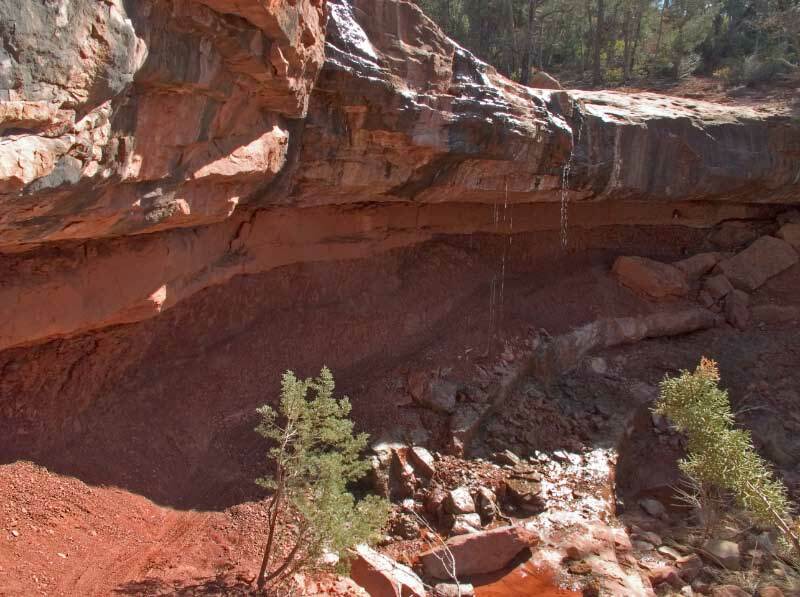 If it's too crowded, you can continue on SR 89A for about .6 miles to the Grasshopper Point turn-off on your right. Pay your five bucks and drive down to the actual parking area which usually isn't crowded. From the Midgely Bridge Trailhead follow the sign to the "Vista," cross under the bridge and turn left, parallel to the road. After about .2 miles, you'll see a wooden sign pointing to the right and Oak Creek (Huckaby Trail), and straight ahead to Grasshopper Point. Follow the path paralleling the road for less than half a mile until you intersect with the access road to Grasshopper Point to get to the north end of Damifino. Walk down to the parking area and look for the sign for Allens Bend trail. Allens Bend trail is a short, lovely trail following Oak Creek. After about half a mile where there are some ruins, the trail splits. You'll take the right fork and start looking for a way across the boulder field and Oak Creek into Casner Canyon on the right. You're looking for the beginning of the Casner Canyon trail. You follow it for about .2 miles until you see an unmarked trail leading steeply up on the right. This is the north end of the Damifino trail.